James Paul McCartney was born on June 18, 1942; in Liverpool, England, to Mary and James McCartney. His mother was a maternity nurse, and his father a cotton salesman and jazz pianist with a local band. In addition, the young McCartney was raised in a traditional working-class family; much the same as his future fellow Beatles Ringo Starr and George Harrison. Tragically, when McCartney was only 14 years old, his mother died of complications after a mastectomy. His future bandmate, John Lennon, also lost his mother at a young age—a connection that would create a close bond between the two musicians. The Beatles disbanded in 1970, breaking fans’ hearts worldwide. 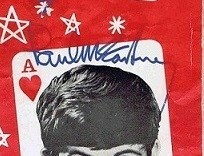 However, Paul McCartney autograph had no intention of dropping out of the public eye. He was the first of the Beatles to release a solo album (McCartney, 1970); and though critics’ reactions were mixed, the album was a hit with the public. 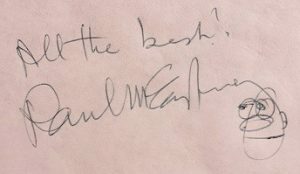 Encouraged, Paul McCartney autograph went on to form Wings; a band that would remain popular throughout the ’70s, winning two Grammy Awards and churning out multiple hit singles. Paul McCartney is pop music royalty. Additionally, for his contributions to global rock ‘n’ roll culture, he has been knighted, named a fellow at the Royal College of Music, was the recipient of the Kennedy Center Honors and inducted into the Rock and Roll Hall of Fame, among multitudes of other honours. In 2010, President Barack Obama awarded him the Gershwin Prize, the highest award a musician can receive in America. 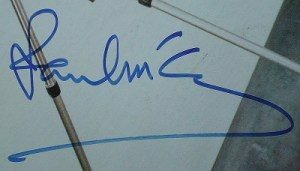 McCartney autographs was the first non-American to receive this honour. Furthermore, two years later, he was named the MusiCares Person of the Year in honour of his artistic achievement and dedication to philanthropy.